I just wanted to share a strange exploration of science funding I've started. (It's an exploration, no guarantee to find something). Alex Hantson from BeOpen Lab is helping me. He loves Belgian beers. Let face it, we all love research but there is more demand than funding. The result is talented post-docs competing for impact factor points. This is probably good for science (really?) but not for postdocs, there also a name for this syndrome: #postdocalypse. I have one mild case. If we could obtain funding sources that are independent of impact factor / publications, we could have less people leaving research, or maybe less students with the postdocalypse syndrome. Here enters Kickstarter. People gives small amount of money to fund projects they care. The result is huge: 7,800,000 persons already supported 77,900 projects raising 1.5 Billion dollars. Kickstarter is moving into science. Again, no guarantee people do care about Science, but it's worth the experiment. Kickstarter made a call and my project is one of the 12 selected for the launch. This means the Kickstarter outreach team will work with me to make a decent campaign, deprived of scientific jargon and whatever. They are also organizing an hackathon in NYC (free places), I will be there if you want to join you're welcome. I wrote a project with very modest scientific ambitions, I propose to obtain the meta-genome of 1,000 beers. Yes BEER. I plan to use the data to make an App, you tell the beer you like and dislike and get suggestion of other beers you should try based on DNA similarity. Like if the phylogenetic tree of beers could give insights on beer taste, why not. Beer has many tastes and infinite nuances but there is not an objective way to classify taste, we have to believe in other 'experts' that might not have our preferences. Where does taste comes from? During fermentation. Taste depends on which micro-organisms break down the grain sugars to form aromatic molecules. Every micro-organisms has a different DNA (so a different set of enzymes to break down the sugars). 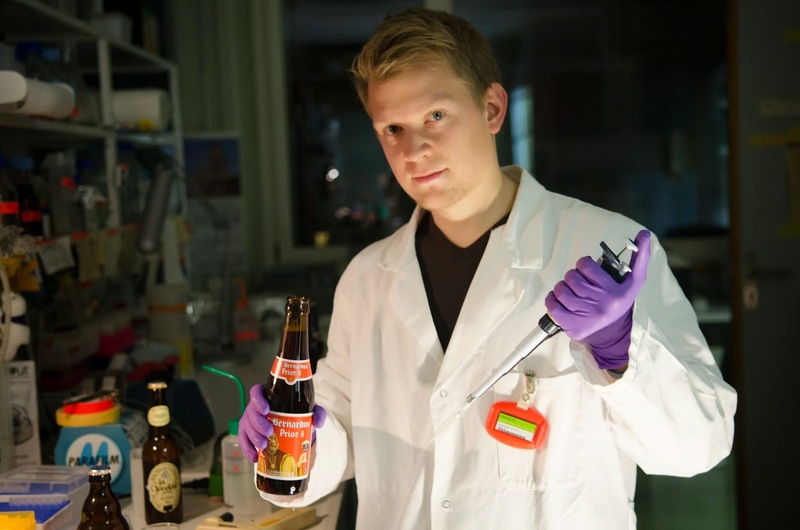 Knowing that DNA could give new insights into beer taste. I'm not leaving research, I'm just exploring other sources of funding to increase my chances to stay in research and heal/deny my postdocalypse. Overall, Joule was a brewer and established the basis of thermodynamics using brewing equipment as hobby. 'Student' was also working for Guinness when he developed the t-test. Do you know other beer facts? (Answer me on Quora) Maybe there is some luck with beer, I do not know. If you want to stay updated with the campaign answer 5 simple questions about beer and you're set. Thanks.